Blogging is a free marketing tool for counsellors. Even better, you do not need to have an in-depth knowledge of website building tools or of Search Engine Optimisation (SEO). Blogging helps build up written content on your website, which in turn helps Google know that you exist, and in time it will start ranking you higher. 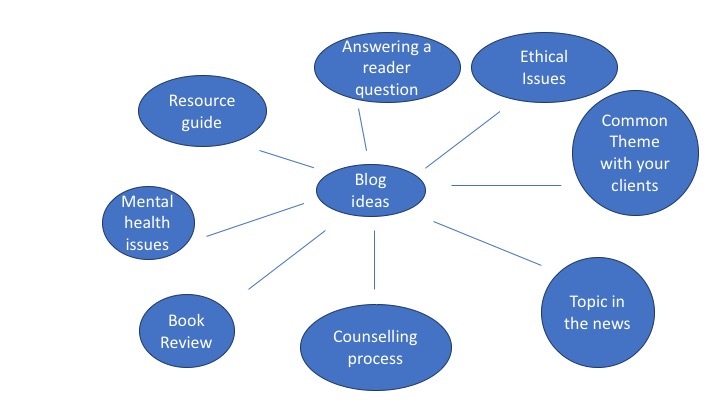 Blogging helps connect you with other counselling and mental health professionals, as well as with local businesses. How to know what to write? Write only what you know about. Ensure what you write is your own material. Do not copy work from another blog. This is important to retain integrity, but also to stop Google from penalising you. How frequently do I need to write? What you write for yourself you do not publish on the blog. Practicing writing is what gets your words flowing. So, every day write 10 minutes for yourself, and then write your blog post. You need to decide how many blog posts you want to write every month. Try to stick to that to maintain some consistency. Do not post 10 posts one month and then leave it for 6 to 7 months. You need to think what time you have to write. How many can you write in a month? I find a blog post can take 3 – 4 hours (this includes writing, editing and posting). A way to ensure your blog posts are published regularly is to schedule your posts. WordPress allows you to do this. How do I structure my blog posts? Start with a catchy title. Your title is your headline. This is what will pull people into reading your blog. It needs to eye-catching. Write a great lead paragraph. Make the topic immediately relevant to your title and explain what people will get in the rest of the post. They will want to read more. Use a photo. A picture can tell a 1000 words! The easiest way is to use your own photos which ensures you are not breaking any copyright rules. Reflect on your personal experience. This not only shows people you are knowledgeable about your subject but it also helps you connect with your audience and makes them want to read more. Make your content simple and easy to read. You need to use short paragraphs, short sentences, and simple words. Use bulleted lists. Help people feel a sense of progress as they read through your posts. End with an-opened question. This will help your reader reflect on what you’ve written. Write around 300-500 words. If you write a long post, you need to ensure that it reads well and is not waffle or the reader will not reach the end of your post. Less than 300 words and Google will not like it. How do I blog ethically as a counsellor? As counsellors, therapists or psychotherapists we adhere to an ethical framework. Within this framework we tell our clients that we shall maintain their confidentiality. We will not talk about them or the material they give us outside of the room. This includes our blogs and any social media presence we have. Remember all social media outlets are public. I have created my own social media policy. I ensure clients are clear that if they comment on my blog or any social media that this comment may identify them and this may make them vulnerable. We, as counsellors, need to keep matters confidential, as well as maintain boundaries. Do not start a blog saying “today I was talking with a client about anxiety and I thought it would be useful to write about it”. This may identify who your client is. Do not engage with any therapy through comments or social media. Always private message the person who has commented and invite them to arrange a session with you or let them know where additional support may be found. Remember, your blog is public and represents you. Think before you self-disclose. If you blog about yourself, reflect on whether it will affect the counselling relationship with any of your clients. One of the most effective ways is through social media sites. Good sites to promote yourself are Twitter, Facebook Google+ and LinkedIn. Remember, you need to interact with these sites. It is no good just posting your new blog entries. You need to build your audience and interact with them. Share other people’s tweets and blog posts. Write on other blogs similar to your own. To have a look at other counselling blogs and how they structure and write their blogs, have a look here. What is your experience of blogging? Do you have any tips you feel are valuable to share?